The concert by the International Contemporary Ensemble (ICE) at the Americas Society could not be timed exactly for Mario Davidovksy’s 81st birthday, which fell on March 4. Yet Friday night’s event was a celebration of the composer’s work nonetheless, exclusively featuring the composer’s work. And as a gift to the standing room crown, there was a world premiere. Davidovksy’s style recalls the title of Kandinsky’s treatise Point and Line to Plane. Not that his music sounds how Kandinsky’s paintings look, but that he emphasizes the horizontal and vertical arrangement of notes through time. As redundant and tautological as that may seem, it is an important description and distinction. Davidovsky’s roots are in the second generation of atonal composers, like Milton Babbitt—with whom Davidovsky studied—with concerns different than trying to preserve functional harmony. His music carves up space and time with systematized logic. Wednesday, March 18th at 8:00pm, ISSUE Project Room is pleased to present Nakatani Gong Orchestra at The Green Building in collaboration with Gowanus Art + Production. A non-traditional orchestra directed by master percussionist and acoustic sound artist Tatsuya Nakatani, each performance brings together a locally selected ensemble of players, who receive specialized training in Nakatani’s unique bowed gong techniques and sign conducting. Orchestra features performers Lea Bertucci, Bob Bellerue, Kim Brandt, Matt Chilton, Steve Dalachinsky, Sandy Gordon, David Grubbs, Chris Haag, Yuko Otomo, Stefan Tcherepnin, Philip White, and Alexis Zaccarello. On view through Sunday, March 22nd, ISSUE presents Georgia Sagri’s Daily Bread (www.dailybread.nyc), a streaming online exhibition and series of public and private performances conveying states of loss, mourning and offering. Open public performances continue today, 1pm-10pm, during which viewers are welcome to visit the exhibition online and at Mathew NYC, 47 Canal Street, 2nd floor, NYC. Gesture—the physical, real-time interaction of performer and instrument—is at the heart of all music making. The trace of the performer’s touch can be heavily imprinted onto the texture of the sound, as in highly physical improvisations on acoustic instruments, or it can be an implicit presence known only indirectly through the movement of the sound, as is true of more touch-sensitive electronic music. Thus it is that the Concordia Laptop Orchestra’s Dancing with Laptops presents the seeming paradox of creating an explicitly gestural sound work through computers. 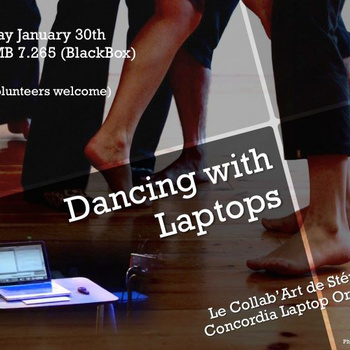 The Concordia Laptop Orchestra (CLOrk) was established by Eldad Tsabary, professor of electroacoustic and sound art composition at Montreal’s Concordia University. The ensemble, which is made up of twenty or so undergrads in advanced courses in electroacoustic music, has a process-based focus on developing improvisational work through a cycle of composition, performance and critical discussion. Dancing with Laptops, a performance for CLOrk in collaboration with dancers Stéphanie Bernard, Claudine Dubé and Émilie Morin, was conceived as an improvisational dialogue between sound and movement in which the dancers’ physical gestures would be translated into sound gestures through the mediation of prearranged compositional parameters and engaged observation. As can be seen in the video of this performance, the music does set up an elaborate series of correspondences to the movement throughout its 31-minute length. The musicians create such sonic analogues to the dancer’s physical motions as the swoop of a glissando as a dancer unfolds her body to full length; reverberant percussive thumps underscoring leaps and landings; or open silences enveloping pauses in movement. More generally, the ebb and flow of sound events operate as an audio image once removed of corresponding variations in the pace and intensity of the dance. This affords a kind of parallel motion between musicians and dancers as filtered through such formal qualities as tempo, dynamics and textural density. Happily, CLOrk leave ample open spaces and avoid submerging the dancers under an overwhelming mass of constant sound. Although as a sound work Dancing with Laptops was performed as one half of a larger, integrated multimedia work, it stands on its own as a finely constructed composition of engaging timbres. Corrie van Binsbergen´s Self Portrait in Pale Blue is a sharing almost too intimate. I feel like I´m eavesdropping on something very private, and I feel that she felt the same thing when she played, and feels a bit conflicted about it. The Dutch guitarist´s solo confessional is a happenstance, a suggestion made by a colleague at the end of a difficult period for van Binsbergen – broken hand, move from city to country, loss of mother. Unprepared, her self-imposed criterion was to play as few notes as possible. But great restraint does not necessarily mask emotional upheaval. The first of the thirteen, numbered tracks is however unhesitatingly colourful, eight minutes winding notes backwards, spinning them off into corners, sandpapering strings. Few of the remaining tracks top two minutes; some are sweet, some are perplexed. One I would deem celebratory, another is just so very warm. One chuckles over a private joke recalled; another sounds like a song that suddenly ran through her head. A walking daydream breaks off suddenly, a moment is made to say thanks, a cri de coeur can´t quite get itself out. Her final track is almost as long as her first, more of a textured abstraction of white-on-white, a backdrop for the listener to project his or her own thoughts of what has come before. Neither melancholia nor sober account taking, van Binsbergen seems ultimately optimistic while reflecting with realistic expectations about how the past influences the present. Two New ones from Tzadik: John Zorn/John Medeski’s Simulacrum & Per Bloland! Alex Von Schlippenbach/Evan Parker/Paul Lovens Studio CD! Evan Rapport’s “Greeted With Smiles” Book! Open Loose with Mark Helias/Tony Malaby/Tom Rainey! Myra Melford‘s Snowy Egret: Ron Miles/Liberty Ellman! Harris Eisenstadt/Michael Moore/Sara Schoenbeck/Mark Dresser! Henry Kaiser/David Wessel/Chris Muir! Rez Abbasi/Bill Ware/Stephan Crump/Eric McPherson! Kenny Wheeler/Christian Maurer Quintet! Three from Ben Bennett + Jack Wright! Uneven Eleven: Kawabata Makoto/Charles Hayward! Plus Lots of other All-Purpose Weirdness and Archival Discs! 6pm: BIGGI VINKELOE & RAW Sound SWEDEN! 7pm: CHERYL PYLE & BIGGI VINKELOE DUO! 2pm: KRESTEN OSGOOD & MARTIN PHILADELPHY! 6pm: STEVE SWELL – Solo Trombone Set! 6pm: Carl Ludwig Hubsch – Solo Tuba! 6pm: ANDREW D’ANGELO – Solo Alto Sax! 7pm: MARCO CAPPELLI – Solo Guitar!